A couple of days before IFA kicks off officially, Sony unveiled its lineup for the expo. The company announced four new Xperia smartphones along with a new Xperia tablet. It should come as no surprise that Android Ice Cream Sandwich powers the whole lot. The four new Sony Android smartphones are named Xperia T, Xperia V and Xperia J, and they all build on the Xperia arc design. The Xperia T is the global flagship model. It packs a 4.6" screen with 720p resolution and shatter-proof, scratch-resistant glass. The chipset is a Qualcomm Snapdragon S4 with a dual-core Krait CPU at 1.5GHz, 1GB of RAM and Adreno 225 GPU. The Xperia T has a 13MP camera with LED flash. The camera can shoot 1080p videos and there's a front-facing camera capable of 720p videos. The device measures 129.4 x 67.3 x 9.35 mm and weighs 139g. It comes with 16GB of built-in storage, which you can expand through the microSD card slot. The phone will come in two different versions - an LTE-enabled version (102Mbps down, 51Mbps up) with quad-band 2G and quad-band 3G and an HSPA+ version (42.2Mbps down, 5.76Mbps up) with quad-band 2G and penta-band 3G. Both use a microSIM card and a 1,850mAh battery. The phone also comes with a cool new "One touch" feature, which uses NFC to sync the phone's music playback with supported speakers. James Bond himself will be using the Sony Xperia T in the upcoming Skyfall movie. The Sony Xperia TX also joins the party - it's nearly identical to the Xperia T, but is headed to Asia. According to its white paper it packs a Snapdragon S4 chipset, although the Sony product page says otherwise so we can't be perfectly sure. So either the TX will have dual-core Krait processorm and Adreno 225 or dual-core Scorpion CPU and an Adreno 220 GPU. Either way the RAM is 1GB. The Xperia TX measures 131 x 68.6 x 8.6 mm, weighs 127g and comes with HSPA+ support and a microSIM card slot. The battery capacity is slightly reduced compared to the Xperia T at 1,750mAh. The Sony Xperia V is LTE-enabled (100Mbps down, 50Mbps up), but also has quad-band 2G and quad-band 3G connectivity. It comes with IP57 certification, meaning that it's completely dust-protected and that it can last for up to 30 minutes under a meter of water. It differs from its T and TX siblings in terms of screen size - the Xperia V has a 4.3" 720p screen - but it keeps the 13MP camera with 1080p video capture and Qualcomm S4 chipset with dual-core Krait CPU, clocked at 1.5GHz, Adreno 225 GPU and 1GB of RAM. The built-in storage is 8GB, but there's also a microSD card slot. The Xperia V measures 129.0 x 65.0 x 10.7 mm and weighs 120g. The battery has 1,750mAh capacity. It will be available in White, Pink and Black but it's possible that its market availability will be limited (details are scarce right now). The Sony Xperia J offers a great screen for its price range - a 4" screen of FWVGA resolution and Gorilla glass. The phone itself is powered by a single-core 1GHz Scorpion processor with 512MB RAM and will launch with Android ICS, just like its more expensive siblings. It has 4GB of built-in storage plus what you put in the microSD card slot. The camera is a 5MP unit with VGA video recording capabilities. For connectivity, there's quad-band 2G and dual-band 3G. The Xperia J is quite thin for an entry level device - 124.3 x 61 x 9.2 mm - though it's a bit hefty at 130g. The battery is tipped at 1,750mAh capacity. Today we also saw the first Sony tablet, which is an official part of the Xperia family. It's called Sony Xperia Tablet S and you can read more about it in our blog. Sony is also bringing a set of media apps that will work on their Xperia phones, the Xperia tablet and even the Vaio laptops. 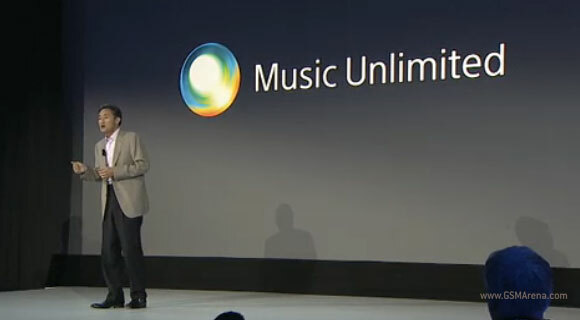 The company will also be offering a 60-day trial for their Music Unlimited service along with a new subscription service called Access - for a monthly fee, you'll get unlimited access to the millions of tracks available.